478 people in our community are currently praying with you. The Libera Boys Choir with a sweet rendition of God Rest You Merry Gentlemen. Dear Lord, I give you my hands to do your work; I give you my feet to go your way; I give you my eyes to see as you see; I give you my tongue to speak your words; I give you my mind that you may think in me; I give you my spirit that you may pray in me. Above all, I give you my heart that you may love in me. I give you my whole self, Lord, that you may grow in me, so that it is you who lives, works and prays in me. Heavenly Father, open to me the gates of righteousness, that I may enter through them and give thanks to You. For Jesus Christ is surely the gate of the Lord, and those that confess His holy name shall surely enter through it. I thank you that you have answered me and have become my salvation. No matter how weak I may be, I will always remember your words, that the stone that the builders rejected has become the cornerstone of your church. This is your doing, and it is marvelous in my eyes. This is the day that the Lord has made; let me rejoice and be glad in it. Almighty God, give us grace to cast away the works of darkness and put on the armor of light, now in the time of this life, in which your Son Jesus Christ came to visit us in great humility; So that, at the last day, when he shall come again in his glorious majesty to judge the living and the dead, we may rise to the life immortal. The Lord bless us and keep us. The Lord make his face to shine upon us, and be gracious unto us. The Lord lift up his countenance upon us, and give us peace, this day and evermore. 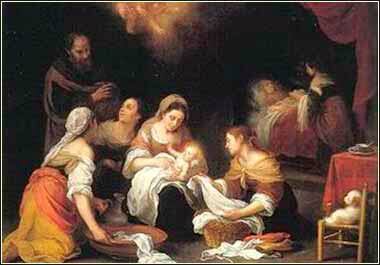 Birth of John the Baptist by Murillo, c. 1660. Now the time came for Elizabeth to give birth, and she bore a son. And her neighbors and relatives heard that the Lord had shown great mercy to her, and they rejoiced with her. And on the eighth day they came to circumcise the child. And they would have called him Zechariah after his father, but his mother answered,"No; he shall be called John." And they said to her, "None of your relatives is called by this name." And they made signs to his father, inquiring what he wanted him to be called. And he asked for a writing tablet and wrote, "His name is John." And they all wondered. And immediately his mouth was opened and his tongue loosed, and he spoke, blessing God. And fear came on all their neighbors. And all these things were talked about through all the hill country of Judea, and all who heard them laid them up in their hearts, saying, "What then will this child be?" For the hand of the Lord was with him. The events recounted by today's Scripture follow the chronology of Luke but are a bit misleading as to the timing of events. 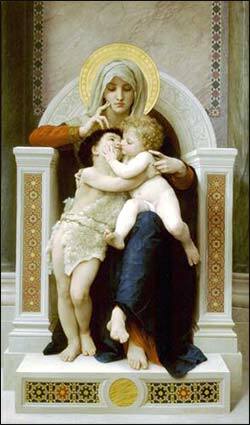 John was actually born about six months before Jesus (and the feast of his birthday is celebrated on June 24). 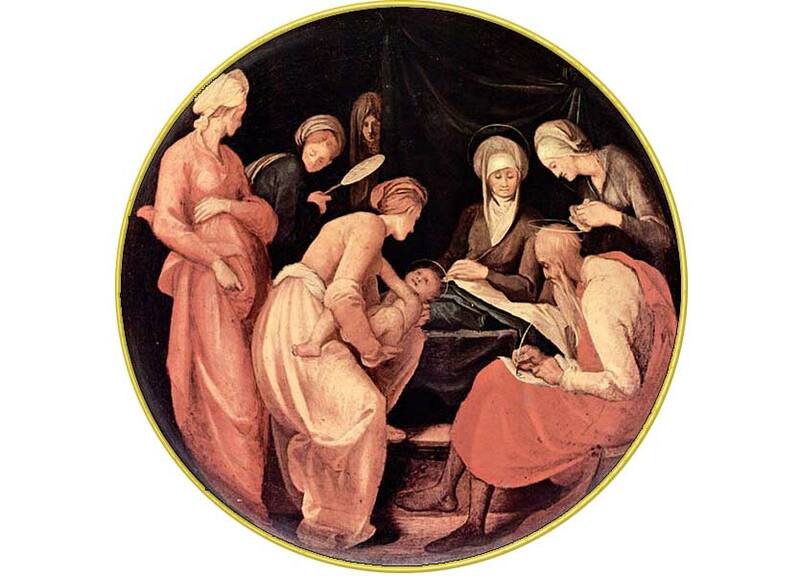 Nevertheless, his birth is properly part of the Christmas celebration, because of the parallels between them and because of the amount of interaction between John's mother, Elizabeth, and Mary during their pregnancies. His birth is part of the Christmas story. John the Baptist had a specific role ordained by God as forerunner or precursor of Jesus, who was the foretold Messiah. The New Testament Gospels speak of this role. In Luke 1:17 the role of John is referred to as being "to turn the hearts of the fathers to the children, and the disobedient to the wisdom of the just; to make ready a people prepared for the Lord"; in Luke 1:76 as "thou shalt go before the face of the Lord to prepare his ways"; and in Luke 1:77, "To give knowledge of salvation unto his people by the remission of their sins." Jesus replied, 'To be sure, Elijah comes and will restore all things. But I tell you, Elijah has already come, and they did not recognize him, but have abused him as they wished. In the same way the Son of Man is going to suffer at their hands.' Then the disciples understood that he was talking to them about John the Baptist." Isaiah 7:14: Therefore the Lord himself will give you a sign: The virgin will be with child and will give birth to a son, and will call him Immanuel.